A man wanted for series of shootings, including two murders in Irvine and a fatal shooting of a Riverside police officer, was in San Diego this week and may still be in the county officials said. The suspect is former Los Angeles Police Department officer and Navy Reservist Christopher Jordan Dorner, the man at the center of a statewide manhunt. Investigators say Dorner was responsible for a shooting spree in which three officers were shot -- two in Riverside, one in Corona -- early Thursday morning. The former LAPD employee was wanted in connection with a double slaying Sunday in Irvine. “We believe that Christopher Dorner has been in the San Diego area between the time of the first two murders which was on Sunday [Feb. 3] and today,” San Diego police Capt. Terry McManus said. A large number of local law enforcement officers converged on Naval Base Point Loma near North Harbor Drive and Spanish Landing Park just before 10 a.m.
Officials said Dorner stayed in the Navy Gateway Inns and Suites, a hotel regularly used by officers and their families. He checked into the hotel Monday, but did not check out. Thursday morning, someone on the base thought they saw him, but that was later determined to be a misidentification. "We're scouring the area for the vehicle," said Lt. Joseph Ramos adding that officers haven't spotted Dorner's truck or anyone matching his description. "Obviously he is very familiar with the area." An officer at Naval Base Point Loma told NBC 7 San Diego that people were ordered to stay in their rooms this morning however as of noon, Naval Base Point Loma was no longer on lockdown. “We do not know if in fact he’s in the San Diego area,” McManus said at an 11:45 a.m. briefing in front of San Diego's downtown police headquarters. An LAPD badge and Dorner's photo identification were found near Lindbergh Field by an airport shuttle driver. Other equipment possibly connected to Dorner was discovered in a National City dumpster. He may also be involved in the attempted theft of a boat at a San Diego marina. Dorner is wanted in connection with the fatal shooting of a man and a woman in Irvine Sunday. The former police officer is believed to be on a shooting rampage based on evidence found in a written "manifesto" entitled "Last Resort." In it, Dorner writes that the "horrendous murders" are "a necessary evil." "He’s brazen and he’s on a hunt to do whatever havoc he can,” said LAPD Sgt. Rudy Lopez. San Diego police shut down North Harbor Drive heading east from Point Loma due to the investigation. High Tech High Point Loma, located in Liberty Station about a mile from the base, has been placed on lockdown as a precaution because of the manhunt. Agencies involved in the manhunt include U.S. Marshals, California Highway Patrol, San Diego County Sheriff's Department, Harbor police, military police and San Diego police. CHP officers statewide are on alert. All court appearances for CHP officers have been canceled Thursday. If you spot the suspect or the vehicle, officials warn you not to engage him but to call 911. Around 1:45 a.m. Thursday, two Riverside officers were shot after they responded to a call for assistance from Magnolia and Arlington Avenues (map). Someone had reported seeing the suspect’s vehicle in that location. "By all accounts, it appears they were stopped at a red light and just ambushed by the suspect," said Riverside Lt. Guy Toussaint. One Riverside officer was pronounced dead at the scene. The second officer was taken to a nearby hospital where the officer underwent surgery, police said. Corona Sgt. Brent Nelson confirmed that the Riverside shooting is connected to another Thursday morning shooting in Corona. LAPD's Newton Division confirmed early Thursday that two of its officers were involved in a confrontation with a man believed to be Dorner. The officers were en route to a special detail to protect individuals named on the manifesto at 1:25 a.m. when they spotted Dorner's vehicle. They started to follow the vehicle and ran its plates. They were told the plates did not match the vehicle according to LAPD Sgt. Lopez. As they were making the turn off the freeway, they were shot at Lopez said. While officials could not confirm the type of weapon used in the Corona shooting, Lopez said, " I would say it’s a safe bet that he’s carrying a semi-automatic rifle." One officer suffered a graze wound to the forehead and was treated at the scene. A third officer-involved shooting was reported at about 5:30 a.m. in Torrance. 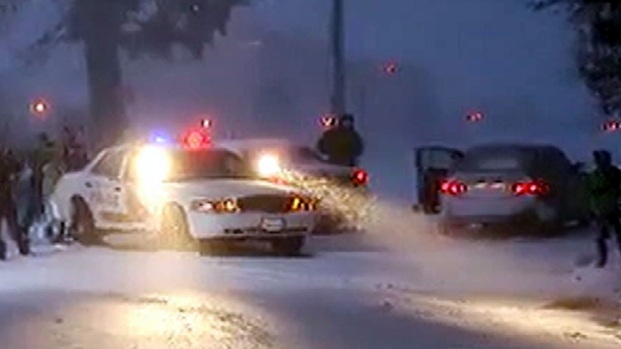 Officers said that shooting was connected to the Dorner search. Dorner is wanted in connection with the double slaying of a newly engaged couple last weekend, Irvine Police Chief David Maggard said Wednesday evening. Maggard said that Dorner implicated himself in a "multi-page manifesto" that was published online but has since been taken down. A source inside LAPD gave NBC4 the manifesto, which is about 11,300 words long and appears to lay out a plan for targeting those involved in his firing. In the manifesto -- addressed to "America" and titled "Last Resort" -- Dorner writes that the "horrendous murders" are "a necessary evil." "I know I will be villified (sic) by the LAPD and the media," he writes. "Unfortunately, this is a necessary evil that I do not enjoy but must partake and complete for substantial change to occur within the LAPD and reclaim my name." Dorner goes on to say, "There will be an element of surprise where you work, live, eat, and sleep." Monica Quan, 28, and her fiancé, Keith Lawrence, 27, were fatally shot Sunday while sitting in their car on the top level of a parking structure in the 2100 block of Scholarship Drive, according to Irvine police. The recently engaged couple was last seen in Winnetka at a Super Bowl party, and lived in the apartment complex attached to the parking garage. The couple left the party about 7 p.m. and were found slumped over in their car about 9 p.m.
Quan's father was the first Asian-American to become an LAPD captain, and also worked on the Asian Gang Task Force. In his manifesto, Dorner repeatedly refers to a Randy Quan as being involved in his firing. Authorities asked for the public's help in finding Dorner, whose last known address is 4931 Sharon Dr. in La Palma. Dorner is described as 6 feet tall, about 270 pounds with black hair and brown eyes. The vehicle also has ski racks on the roof. CHP Officers have received numerous tips from the public reporting gray or blue Nissan pickup trucks. LAPD Chief Beck, who held a late-morning news conference in Los Angeles, said he could not comment on the San Diego situation. "I'd tell him to turn himself in, this has gone far enough no more people need to die," Beck said at that briefing. A shuttle driver discovered an LA PD badge and a wallet with Dorner's photo identification in San Diego and turned the items over to Harbor police at 2:27 a.m.
San Diego police confirm the badge was found at the corner of Pacific Highway and Laurel Street. Several rental car companies and a gas station are located at the corner. On Wednesday, a person flagged down a National City police officer saying they had found some police equipment in a dumpster. According to department spokesperson Alex Hernandez said Irvine police drove to National City and took custody of that equipment because they believe it may be connected to Dorner. San Diego police were called to the Southwestern Yacht Club located at 2702 Qualtrough Street for an apparent boatjacking around 10:26 p.m. Wednesday. The 81-year-old boat owner was on his 42-foot sundeck cruiser when a “heavy set man in his 30s dressed in black clothing” robbed him, tied him up and pulled the boat out of the slip officials said. The man could not start the boat so he took some items from the vessel and left according to police. 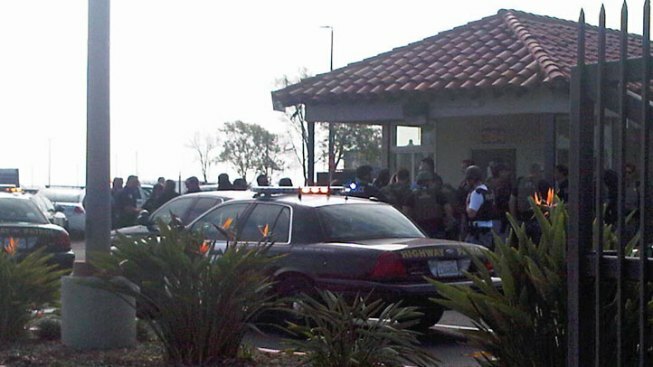 San Diego police have not confirmed if the suspect in the attempted robbery at the Yacht Club was Dorner. The incident was being evaluated for forensic evidence to determine if Dorner is a possible suspect according to Hassen. On Thursday evening, a second truck believed to be linked to Dorner was found in Poway, Irvine police confirmed. At around 6:10 p.m., a truck of a make and model similar to that of Dorner’s Nissan Titan was located at the Poway Sheriff’s Substation at 13100 Bowron Rd. Police believe Dorner may have stolen license plates from this truck, which explains why authorities gave two possible license plate numbers for Dorner’s Titan earlier on Thursday. Irvine police processed the vehicle in Poway for physical evidence, including fingerprints. At this time, police say they’re not sure how the truck ended up at the station. This discovery came after Dorner’s burned-out vehicle was found by police off a forestry road Big Bear.